Is this what a united Sri Lanka looks like? In his first formal address following the end of a civil war that defined the lives of generations of Sri Lanka, the President, who had before him an opportunity to say anything he wanted – to atone, apologise, remember, reassure, acknowledge, any number of things that would reflect the mood of a man at the helm of a nation that was on the threshold of possibility, change and peace – chose to state his position, clear and simple. Sri Lanka was a new nation – and here we had only room for one kind of person. While it was unclear whether it was a clumsy attempt at encouraging unity, or a blatant erasing of history and truth, whether it was a promise or a threat, it was clear that it was a sign of things to come. Any emergence of the issue of truth and accountability in Sri Lanka, especially questions regarding the events of 2009, the last stages of Sri Lanka’s civil war, in which several thousands of Tamil civilians are alleged to have been wounded and/or killed, both by LTTE and by Government Forces, making the GoSL guilty of war crimes. The pointing out that the civil war in Sri Lanka was a symptom of a much larger problem – a complex ethnic issue – and not, in fact, the problem itself, which means then that one is implying that the military defeat of the LTTE has not solved the problem, but has only solved one part of a problem, which persists even today and requires a sustainable, long-term solution. Allegations of war crimes emerged in 2009 following the ‘end’ of the war: many independent observers seemed to believe that in what the GoSL had labelled a ‘humanitarian mission’ of rescuing Tamil civilians from the clutches of the brutal LTTE, several thousands of Tamil civilians had, in fact, perished. The United Nations, based on credible eye-witness accounts from civilians and aid-agencies working in the war zone, put the death-toll at around 6,500 at the beginning of 2009. It became harder to identify exact numbers after this, as the GoSL made it near-impossible for any independent sources to remain within the areas of fighting, but several reports put the death toll of the next four months (mid January – mid May 2009) at about 15,000 – 20,000, with something like 350,000 civilians displaced in that last year. These same sources were also able to verify that the government’s Armed Forces were responsible for indiscriminate shelling, particularly in government allocated ‘No Fire Zones’, which may have caused civilian deaths and casualties in large numbers. The Government asserted strongly that it had adopted what they called a ‘zero civilian casualty’ policy and stuck by it. While concerns grew, the GoSL continued to deny any allegations. The President and his brother, Gotabhaya Rajapaksa, the Defense Secretary, repeatedly and very publicly stated that ‘not a single drop of civilian blood had been shed’ by the Sri Lankan Armed Forces. Many well-respected academics, activists, journalists and policy-makers were demonized and labelled as traitors for bringing up the issue of accountability, and for supporting the international community’s demands that the government allow and/or facilitate a full and independent inquiry into the events of 2009. The government-controlled media played a crucial role, by publicly identifying these figures as being those who were ‘working with the LTTE’ or were on the ‘payroll of the LTTE’, sometimes forcing them to move overseas into exile, or to continue their work here under great duress. It was deemed ungrateful, impolite and unpatriotic to ask questions about what really happened in 2009. However, now faced with immense pressure, the government made a move to create the Lessons Learnt and Reconciliation Commission (LLRC). Made up almost entirely of senior bureaucrats/government employees appointed by the President himself, this did not technically meet the definition of ‘independent’. Similarly, there was an outpouring of patriotic sentiment against the LLRC. Malinda Seneviratne, a Sri Lankan journalist, wrote sardonically in one article ‘…we moved on from the 1971 insurrection without letting the trauma of it all get under our collective skin…’ and implied the LLRC was unnecessary in helping us ‘get over’ the war. He was not the only one to say so, nor was he the only one to suggest that something like the LLRC was ‘not our way’, that a process of reconciliation to which such a Commission was vital, and truth and accountability were integral, were ‘Western ideas’. Many people, just like Dyzenhaus said, could not understand how a full inquiry was useful, leave alone necessary. This perpetuated the belief that any investigations into the events of 2009 could be potentially damaging to a process of reconciliation, not helpful. That it would demoralise the people of a newly ‘united’ Sri Lanka and would destabilise the government’s plan for development and ‘integration’. That to ‘dig in to the past’ was unnecessary, in a time when terrorism had been defeated and all Sri Lankans should be enjoying the newfound peace. We were handed an identity: one nation, one Sri Lanka, in which we were all Sri Lankans, and that identity, to which we had to subscribe (or else you were ‘unpatriotic), came with a specific set of conditions. That we accepted the idea of peace, at whatever cost, and unity, above all else. That we believed that a process of ‘reconciliation’ had begun (even though the ‘truth’, it would seem, had no place there). This government was doing reconciliation their way, and there was not much point in asking whether it was adequate, or indeed genuine. That to question the integrity of this process was to shake the very foundations of our identity, the idea of who we are. And who would want to go there? The other point that triggers the ‘one nation, one Sri Lanka’ rhetoric is the question of race and ethnicity. How can one approach post-war reconciliation in a country that is divided by ethnicity – where the distinction between a significantly large majority and a minority is ethnicity? Once again, in a campaign that began essentially on that morning where the President told his parliament that there was no such thing as ‘minorities’, the Sri Lankan government set out to build and market a national identity that was based purely on nationality, and totally, allegedly, denied ethnicity. Of course it really doesn’t – it doesn’t deny the Sinhalese their ethnic identity, just everyone else. 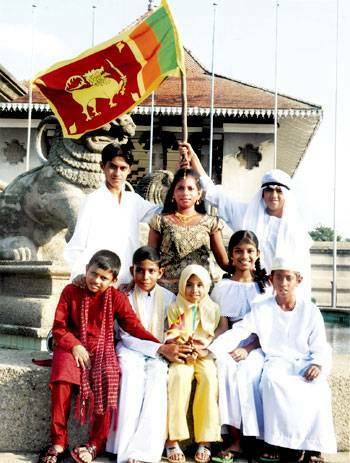 ‘We are all Sri Lankans’ we were told, ‘not Sinhalese, not Tamil and not Muslim’. It just wasn’t important. What was important was that we are Sri Lankan – and what does it mean to be Sri Lankan? That the lion, by default, represents who we are, that we continue to live in a country run primarily in the Sinhalese language, that the Armed Forces dominating much of the ‘newly-freed’ North and North East could not speak a word of Tamil, that minority rights means that they can enjoy their rights and privileges if they learn our language, work our jobs and ‘integrate’ themselves into our society. It was about becoming ‘one’ – but what that actually means is that we expected them to become ‘one’ of us. A blatant denial of the existence of minorities became seen as a call for unity. But some people, once again, had some questions: can we talk about the complexities of a national identity in a multi-ethnic nation, riddled by an ethnic conflict which led to a long civil war? Can we stop to consider that you might not be able to apply a blanket, simplistic idea of ‘one nation’ to a multi-ethnic community where one ethnic group is dominant, economically, culturally and politically? Can we acknowledge that while the LTTE did not represent the entire Sri Lankan Tamil population of Sri Lanka and we know they were a loose-cannon that took matters into their own hands, history shows that they were not alone in feeling like they had been wronged by generations of Sinhala-dominated governments and politics? The government, once again, started to label anyone that cared to point these things out as being ‘racist’ and being against the government’s efforts to reconcile the Sri Lankan population after a bitter war. To bring up race was to be racist. To say the ‘war is won, but the battle is not over’ was to be racist. As far as they were concerned, the war was the entire battle, and they had taken care of that. So what we were whining about? Our ethnic identity is a large contributor to the idea of who we are and where we belong. It places us within a specific community, a specific culture and within specific frameworks made up of these cultural ideas and traditions, heritage and history. Identity is about belonging, and of course the idea of belonging is something of a sensitive topic for the human species. We long to belong. Can we deny our ethnic identity for the ‘greater good’? Should we? Can there be real unity achieved through this denial, rather than an attempt to properly understand and acknowledge our ethnic backgrounds and histories? Can there be real unity without equality? Online, and off, there has been much discussion on this topic. The idea that nationality must take precedence over ethnicity has been resoundingly championed, as another offshoot of patriotism. Indi wrote ‘I am not my race. I am Sri Lankan’, whereas Kumar Sangakkara famously said, ‘I am Tamil, Sinhalese, Muslim and Burgher’, which was an interesting shift from the negative (‘I am not’) to the positive (‘I am’) – an acknowledgement of ethnicity in national identity, rather than the denial of one for the other. More recently, a popular online campaign, Not in Our Name, was launched to counter the incident of blatant Buddhist-dominance in Dambulla (a detailed account of the incident, including videos are available on the Not in Our Name blog). It called for everyone and anyone possible to put down their name against religious extremism in Sri Lanka. The result was hundreds of personal statements, from Sri Lankans and non-Sri Lankans, personalities with an online presence and those who had never engaged in online discourse before. The statements were powerful and personal and each one was about identity. The statements came from those who deliberately identified themselves in terms of ethnicity, religion and nationality, they came from those who carefully denied a single ethnic or religious identity and embraced a ‘Sri Lankan’ identity (one in which they were neither Sinhala nor Tamil, neither Buddhist nor Christian, but Sri Lankan), and they came from those who claimed their identity embraced the diversity of multiple ethnicities and multiple religions and remained Sri Lankan because of this (a la Kumar Sangakkara, ‘I am all ethnicities, I am all religions’). It became an interesting forum of discussion, in which all kinds of Sri Lankans not just stood up against bigotry and violence, but also unwittingly reflected on diverse ideas about identity, through a declaration of their own sense of who they were. One thing was obvious: it matters to us who we are, and our idea of who we are is a summation of so many different things. We are entitled to the freedom in which to explore this space completely, discover where it leads, and accept and embrace whatever it is that we may find there. It matters whether we are Sinhalese, or Tamil, or Muslim, or Burgher, or Eurasian. It matters whether we are Buddhists, or Christians or Catholics, or atheists. It matters where we come from, where our families came from, and what they chose in life. It matters where we were born and where we now live. It matters where our relatives live and where they came from and where they were born. These things matte, not in creating divisions and not in being used to discriminate – which is what they have been used for thus far – but in accepting, embracing and ultimately celebrating the diversity of who we are, in understanding completely what drives us and what other things matter to us. Of course, you can see how easily these concerns can be twisted to reflect genuinely racist values. There is no shortage of Sinhala-Buddhist extremists who would gladly assert the need for ethnic identity and an exploration of ethnic histories in order to propagate Sinhala-supremacist ideas, and the Dambulla incident was a perfect example. ‘The Sinhalese were here first’ and other such arguments are abundantly visible in the press and in personal opinion, and they are vitriolic and unproductive. This is the other, more dangerous, extreme. Between the Sinhala-Buddhist nationalists and between those denying ethnicity completely in order to embrace a false ‘total’ national identity, there was and continues to be little room for moderate voices calling for a thoughtful and less one-dimensional approach to Sri Lanka’s very complex problems. Can there be a real ‘moving on’ for everyone – for our entire nation – without confronting and accepting the truth of what happened to us all or will we be satisfied with a ‘moving on’ for some and not for others? Can there be a narrative history about Sri Lanka that is inclusive of the many stories that make up this truth, or will we continue to let a singular voice be dominant? Is real reconciliation the happy hand-holding that the Government will have you believe it is, or can it be something harder to achieve but longer-lasting, something more complicated, less easy, but more sustainable? It’s important to understand the complexities of ethnicity, caste and class and their histories, in a place like Sri Lanka which is home to a diverse range of all of those things, so that we may find a sustainable and just resolution to our issues. It’s important to sincerely celebrate real diversity – not in the form of ‘cultural pageants’ where children in costume are made to hold hands and propagate outdated ethnic stereotypes and an unreal idea of ‘unity’ and ‘harmony’ – so that we may truly appreciate and understand each other and our relationships to each other and live in peaceful coexistence. It’s important to be truthful and demand truthfulness – as this is an integral part of our identity, our right as Sri Lankans, and our duty as citizens – so that we can all ‘move forward’ with dignity. It’s important to find room for the plurality of our voices, our stories, our experiences and our identities, because to repress some in the name of others is unjust, because to destroy some in the name of others is criminal. It’s important that each of our identities are restored and acknowledged in time – in their full glory, with all their grey areas and nuances. And that is Sri Lanka – no matter how complex, how intricate, how multifaceted. That is what it really is. Subha – this was a beautiful read.